LONG, long ago, in the dim and distant past when 8 bit machines ruled the Earth, Messers Braben and Bell conceived and coded what was to become one of the greatest computer games of our time - Elite. BBC Micro users everywhere abandoned their chores, hobbies and wives in search of the adrenalin buzz as man and machine became one in the inter-galactic adventure of the decade. Until today, Electronic Arts' Interceptor was the only Amiga game to come close to the addictive atmosphere of Elite. Now the ultimate is available on the ultimate home computer - and it's great! Elite is a trading/combat game of mammoth proportions - the playing area covers eight separate galaxies and more than 2,000 planets, each having its own political and economic structure. Such information is of little consequence when playing a pure zap and blaster like Galactic Conqueror, but for anyone hoping to make a name for himself in the galaxy, a must. The ladder to success in Elite is eight rungs long - you begin with a rating of Harmless and progress through the ranks of the Dangerous and Deadly until you finally join the small number of pilots who make it to become Elite. Your rating increases in relation to the number of kills you notch up on your travels. These may be good guys or bad guys, they all count as kills. The only disadvantage of blasting the goodies is the effect that this has upon your legal status. Following a few indiscretions your status will be adjusted to read Offender or even Fugitive, which has undesirable consequences when wishing to dock at space stations in law abiding systems. It is not uncommon for a fleet of police Vipers to form an unwelcoming committee. The base model Cobra MK3 is hardly a ship to put the fear of Zarquon into a battle-hardened space pirate, enter the trading aspect. Data can be called up for any planet in the current galaxy - the two most important items to note are the planet's Tech Level and the Government type. On a technically advanced planet the price of food and textiles is high, but the cost of computers is low, the reverse being true for a planet with a low Tech level. All you have to do is find two such planets in close proximity to each other and satisfy their respective economic needs. The planet's political stability determines how much hassle you will get from pirates. Democratic planets have relatively small pirate populations in comparison to the fleet of fighters that you will encounter when visiting an Anarchic system. Drawing upon all of your capitalist instincts, you amass as many credits as you can in order to upgrade your Cobra. With sufficient funds you can buy more powerful lasers, a larger cargo bay, an escape pod, and most useful of all, a docking computer. Before you can make any money in the trading business you must master the technique of docking with the Coriolis-type space station. All you have to do is line your ship up with the single opening and coax the ship slowly into the docking bay. Oh yes, I almost forgot, the space station is rotating, so you will have to rotate your ship too! Inside the station you can call up a wide variety of navigational and trading options. Using the local and galactic charts you can display planetary data - useful when planning trade routes. By studying the prices screen you can make shrewd purchasing decisions and pack your 20 Tonne hold with the goods that will reap you the biggest profit. The Equip screen displays the items of equipment that can be bought from the current planet - availability varies considerably with the planet's Tech Level. All planets stock fuel and missiles, but expensive items such as military lasers and galactic hyperdrives can only be found on Tech Level 10 or above. In an attempt to reduce congestion and collisions all hyperspace jumps are terminated a short distance from the destination planet and the remainder of your journey should be completed as quickly as possible using the space-skip facility. This automatically deactivates if another vessel is close. Dropping out of space-skip before reaching the planet is a sure sign that you've got pirate problems. When you are deemed sufficiently competent you will be given a mission to embark upon. There are five such tasks, all of which are difficult, all of which will reap you rich rewards. 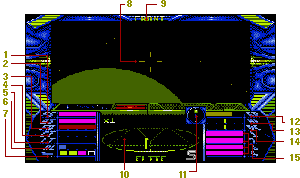 Music and sound effects are given a superb stereo ambiance which heightens the sensation of panic as your on-board computer flashes Energy Low and you can't remember whether you saved the game at the last space station. There have been rumours of Elite II - David Braben is now working on it. If you want some idea of what to expect... Virus was designed as the planet sequence for Elite II - a sort of equivalent to docking. It will be some time. BBC Elite is a classic, the kind of game you will tell your grandchildren about... "I remember when 32k was a lot of ram". Amiga Elite has a number of new features - reverse thrusters to make docking a shade easier, medical supplies have been added to the items in which you can trade, there are five missions - taken from all the previous versions, Amiga Elite is the best. David Braben and Ian Bell's Elite is possibly the most famous and popular game ever written - in Britain at least. The original BBC B program soon spawned versions for the other eight-bit micros, and the 64 version has been in and out of the charts ever since it was released way back in the first half of 1985. In those days, when I was still a gamesplaying civilian, I was one of the many thousands who trooped out and bought Elite - and I played it to death (well, I got as far as 'Deadly' anyway). News of a version for the 16-bit machines came then as a source of some interest. True to form, Firebird have taken their sweet time over it but, better late than never, Elite has arrived on the Amiga. For those unfamiliar with the game, it is a space combat/trading simulation displayed using 3D vector graphics. Starting with nothing more than a standard Mk III Cobra ship, the player is launched into the wild black yonder in order to trade goods between planets (or rather, between their orbiting space stations) while blasting anyone who gets in his way. As money is earned by buying and selling a number of commodities (food, computers, textiles and so on) the player can equip his ship with all manner of bolt-on goodies, ranging from powerful lasers, to homing missiles, an automatic docking computer and the all-important escape pod. As the player's Cobra becomes the ultimate hard machine, he can then start trading with the more dangerous systems, which inevitably means falling foul of hordes of vicious space pirates; attack other traders and steal their cargo, which draws the attention of hordes of vicious police craft; and also indulge in running some profitable contraband, which means having to fend off both greedy space pirates AND nosey police. As more and more 'kills' are notched up, so the player's rating progresses from 'Harmless' to the supreme accolade of 'Elite'- which is no mean feat, by the way. Fortunately, the Amiga game features both disk and RAM save options. With eight galaxies and a total of around 2,000 systems to visit, potential Elitists are not short of places to go. And while there is plenty of hyperspacing, docking, launching and fruitless journeys to be endured, there are also one or two surprises to be discovered along the way, adding some variety and incentive to the task in hand (watch out for secret missions, Thargoids and Tribbles...). My first impression of Amiga Elite was of disappointment. Apart from being filled-in, and having the dubious addition of some gaudy static graphics, the game has not progressed since the 32K BBC program of 1984. There is so much you could do with the game on a 16-bit machine, yet its potential remains untapped. However, it is not all doom and gloom: this is without the best version of the game to appear so far, and is even more entertaining than its predecessors. Dogfighting - which always suffered because of the louse update on the 64 - is now smooth, colourful and enhanced by a pleasing thud when the lasers hit home. It is also the most appealing aspect of the game, since trading does become a (necessary) chore after a while. Mind you, as Ford Prefect might say, the Cobra Mk III still looks like a fish and steers like a cow! I suppose the purists would say (in Ben Elton-style pseudo voice), 'But you cannot change Elite - it is a classic!'. Well, we are not really on about some bit of coloured rag in the Louvre, are we? It is only a game after all, and anyone who has already had a taste of the action (that should include most of you) might be advised to wait for Gremlin's Federation Of Free Traders to appear before going for a second helping. Life is good. You're young, you've recently passed your pilot's exams and you've just been supplied with the very latest Cobra Mk III combat/trader craft. Life is good. You reported to the launch station on the planet Lave early this morning, ready to catch the first shuttle up to the Coriolis station to collect your papers and ship. Your choice of system for a first flight wasn't exactly first class, however - you appear to have dropped into the middle of a dogfight. A lone Cobra Mk I is struggling to escape from a rather nasty Mamba class fighter. 'Obviously a pirate.' You think to yourself as you line up your crosshairs on his back. Just as you loose off a few streams of laser fire, the pirate notices you and loops back to face you. Quickly jamming a few buttons releases a missile towards the Mamba and he soon erupts in a flash of wreckage and flame. But the Mamba wasn't alone - the rest of his squad are bearing in on you, hammering shots into your hull. The Cobra has gone, leaving you to it. But in Elite there are 8 galaxies with over 250 recognised planets in each galaxy. So massive a universe contains very little that is completely predictable. This has all the addictive qualities and all the depth that you could ever want from a game. When you first pick it up and begin to play, the complexity and range of control options are overwhelming - and it may put a few people off (those of you who haven't played the 8-bit versions). However, once you've accustomed yourself to the controls, cruised around a couple of planets, got involved in some dogfights and bought your first extra weapon - well, there's just no going back! Visually, it's dead good: little graphical touches such as the extra ships you find already docked in the space station all add to the atmosphere... The sound effects are similarly ace, if a bit sparse, but that's in no way a criticism: even the silence adds to a sense of loneliness in travelling the vastness of space. I don't think we could have asked for more of this classic conversion: it's simply superb. Oh, playing this takes me back, I can tell you! I remember the days of 15-hour playing sessions in front of my BBC Micro, pondering over the trading complexities of an anarchy system whilst dodging unscrupulous pirate ships. Yes folks! Elite is here! The game is so complex it seems that you have entered a completely different system. Everything is so detailed: planets, buy different things for different reasons, pirates carry the cargo that they would have bought in the nearest station and every piece of equipment has a make and trade history. Once you start getting into the game you find yourself learning all the makes! All the refinements that have been made since the 8-bit versions mean that the original trade and combat game has lost none of it's appeal. It's even better than Starglider 2 - and coming from me that's saying something! Buy as soon as you see it. I've been looking forward to this for a long time - well, a few months at any rate - and it was well worth the wait! The Amiga version of Elite is absolutely incredible! I thought it would be a long time until we saw a 3D game to match the standard of Starglider 2 but it has appeared as soon as this. Hooray! The 3D graphics are incredibly fast and smooth, looking more like real solid objects rather than a computer simulation of 3D shapes - and, surprisingly enough, the 3D seems actually faster than the ST version. The sound adds loads of atmosphere to the game using the stereo sound to full effect (play the game with the sound through a set of headphones and you'll soon see what I mean). Elite is without a doubt the best space game ever. If you miss this you're a lemon. Virtually faultless with choice of controls, detail packed manual, single load... There must be something wrong somewhere, but we can't find it! Superfast and smooth 3D, but the colours could be slighlty less garish. Peaceful rendition of The Blue Danube - remember that from 2001? - set against powerful and atmospheric sound effects. The complexity of the game draws you in but it also gives you a lot to learn. With this kind of depth, it's immensely playable for a very long time. With products like this, Rainbird are rapidly becoming the best 16-bit software house around. Even at £24.95, don't hesitate to buy Elite!